A founding member of evo, Stuart returned in 2014 as Managing editor before being appointed editor in 2017, despite having a patchy car ownership history that includes an Mk3 Fiesta RS1800i and an MGF. A veteran air-cooled endurance racer (2CVs, not 9111s sadly), Stuart has an unhealthy obsession with 1990’s Group A touring cars and will never forgive himself for selling his 306 Rallye. Adam trained as a car designer, then had a brief and fairly disastrous stint flogging cars before starting as a road tester in 2003. Passionate about cars, and an enthusiastic student of motor-racing history, he was a freelance journalist for ten years and evo’s contributing road tester before joining the team full-time as deputy editor in 2017. Owns a 996 Carrera and a 205 GTi 1.9, both the source of endless frustration and happiness. Steve has been driving and writing about cars for a living for over 17 years but careered off the road and into a swivel chair behind a laptop to run www.evo.co.uk. Once got stuck in a TVR Chimaera for 30 minutes while colleagues refused to tell him how to open the doors. Before joining evo, James spent a decade as road test editor at the UK’s biggest weekly motoring magazine. He’s driven nearly every new car on sale today and when he’s not at his desk or behind the wheel, James is busy avoiding household chores by restoring his Mk2 VW Golf GTI. With driving heroes like Mansell, McRae ad Menu inspiring his formative years, a career in the automotive world was never in doubt for Antony. After deciding at university that marketing and advertising cars wasn’t for him, he instead made the step into motoring journalism, where he indulges in further passions for obscure Japanese and French metal and anything that weighs less than a metric ton. 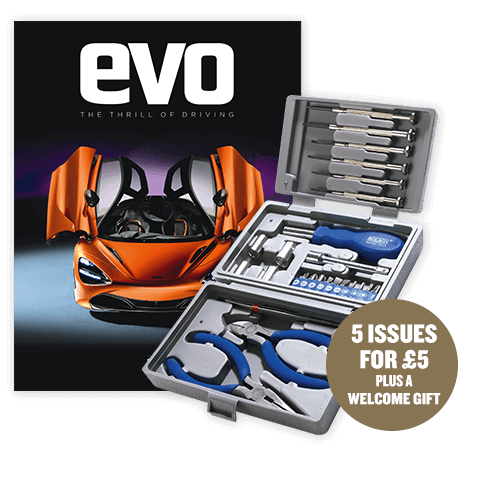 Launch editor of evo, John has almost 25 years’ experience as a motoring hack, having first been a Jaguar apprentice. In 2017 he returned to evo after another six-year stint in engineering, helping to develop new Jaguars and Land Rovers. Owns a V8-engined Capri. Will has been part of the evo team since 2012. As staff writer he spends much of his time driving and writing about cars, but his obsession with vehicles means that even his spare time is filled with cars and at the weekends he tinkers with a pair of old BMWs – even if he would rather be behind the wheel of them. Dickie is one of the founding members of the evo team and a former editor. He has driven at the Nürburgring 24 Hours for Maserati and Aston Martin, competed in the Pikes Peak International Hill Climb twice, and in 2011 set a new world record for a production sedan at Bonneville Speed Week… in Skoda Octavia vRS. The speed? 227.08mph. Yes, honestly. Responsible for mentoring a young Chris Harris, Steve honed his art as a road tester at Autocar, where he also competed for three years in the TVR Tuscan series as works driver before driving for Lexus in the BTCC. He also lapped Silverstone’s International Circuit in Honda’s RA107 Formula 1 car in 48.58sec – just four-tenths behind Honda’s F1 test driver. Has reviewed every significant performance car you can think of. Vivian’s first road rest was of a Vauxhall Chevette HS2300 for Motor magazine in 1978. He felt that, although undeniably quick, it understeered too much, thus nailing early on the essential coordinates for life as a car critic. Thousands of fast cars and over a million words later, he’s still calling it with a healthy contempt for pulled punches and a reckless disregard for stuff that doesn’t concern the only thing that really matters: the driver. Not without peer in the team, Jord also studied car design, but found preference driving them instead. evo’s newcomer is not known for keeping his opinions on car design to himself though, and often uses his Aussie frank-ness to try get away with being ‘honest’ to unsuspecting car designers. Fond of V8s, manual transmissions and avocado on sourdough toast, he fulfills plenty of cliches and minorities in one small package.